The country’s logistics giant, AIR21, opens its biggest business hub in the Philippines at Waltermart Sta. Rosa, Laguna last August 10, 2018. To kick-off the opening ceremony, AIR21 mascot Billy Bills spearheaded a motorcade traversing nearby barangays from Balibago to Sta. Rosa Bayan to Nuvali back to Waltermart. The 35 square meter location is AIR21’s first business hub in Waltermart and the 104th branch nationwide. 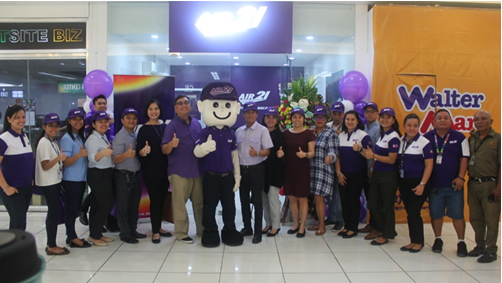 The event was attended by AIR21 executives: Reuben Pangan, President; Ariel Agcaoili, Chief Operating Officer; Yasmin Vasquez, OIC for Branding and Sales Management; and Grace Fernando, Head for International Sales, Operation and Retail Business. Also, the opening ceremony was graced by the presence of UBE Media President, Donna May Lina, UPS Philippines Marketing Manager Marianne Reotiras and Waltermart Leasing Manager Donna Adalin joined by her team Mark Regio de Dios, Angela Dela Cruz and Julianne Ignacio. 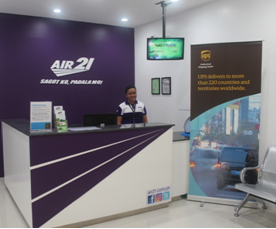 You may visit the newly opened AIR21 business hub located at the 2nd Floor Waltermart Sta. Rosa, Brgy. Balibago cor. Lorenzo St., Sta. Rosa, Laguna.